Dental implants replace a missing tooth or teeth. The implant is fabricated from pure titanium and replaces the missing root of the missing or extracted tooth. Utilizing the principles of microsurgery, the patient can receive this implant by creating a small opening in the gingiva and, when it is possible, an implant may be placed at the same time as the tooth being extracted. This is followed by a healing period of approximately two to six months, after which the patient’s restorative dentist will place a crown on the implant. (1) Fractured/broken tooth. (2) Tooth removed. 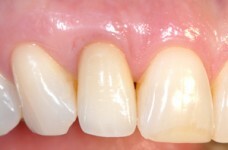 (3) Implant placed at the time of tooth removal. (4) Implant with healing abutment. 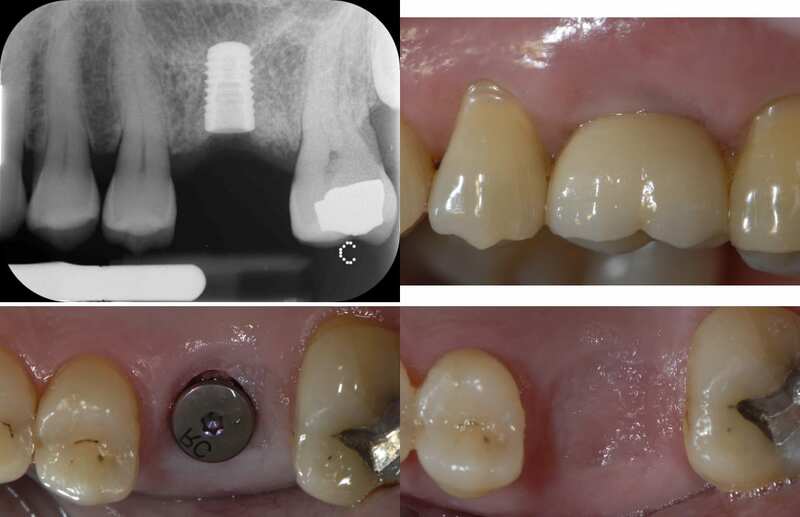 (5) Dental implant with restored crown. Sometimes, Springfield residents can’t help but need a tooth replaced, or multiple teeth replaced. Most of these residents consider getting their missing tooth or teeth replaced with dental implants – the most state-of-the-art tooth replacement system on the market that not only provides you with a natural looking tooth crown, but also a titanium rod to serve as your tooth’s root, stimulating your jaw bone growth so you don’t suffer from resorption. There are several reasons why local dental patients in Springfield consider getting these implants. Perhaps you have a tooth that is diseased or damaged to the point that it needs to be extracted. Or, maybe you’ve lost a tooth due to a facial trauma or mouth injury. Still, other Springfield residents may have lost a tooth or multiple teeth to diseases such as an advanced stage of periodontitis. Whatever caused your desire and need for a tooth replacement, you’ve come to the right placed. With 25 years of experience, Dr. Cross is specially trained in advanced dental implants techniques and is uniquely qualified to perform this oral surgery. Moreover, he takes special care to ease any dental anxiety his patients may feel when approaching their upcoming procedures. Which is Right for You: Immediate Implants or Staged Implants? Most Springfield patients who choose Dr. Cross for their dental implants surgery want to have their new smile as soon as possible. While Dr. Cross always strives to give his patients immediate implants, there are some cases in which staged implants are necessary, and you’ll need to wait months before your permanent crown is placed. Some Springfield patients have adequate jaw bone tissue and sinus height to have implants placed immediately – even on the same day their natural tooth is being extracted. Other patients may require pre-surgeries to make their mouths implant-ready. These include patients who have lost jaw bone tissue, often because their tooth has been missing for some time and their jaw bone has resorbed due to the lack of bone stimulation from the missing tooth root, or they need a sinus lift so that implants can be placed in the upper jaw without occupying the sinus cavity. If your oral examination uncovers that you need a pre-procedure first, Dr. Cross will explain it to you in detail. Common pre-procedures before implants can be placed include sinus lifts and bone grafting. While it may be initially disappointing that you need to wait to see your final results, rest assured Dr. Cross is one of the best periodontists in the United States to perform these pre-surgeries. When performing sinus lifts, Dr. Cross uses an advanced pneumatic pressure tool during his surgeries. In fact, he was the first periodontist in the United States to begin using this tool, which is gentler, more focused, and provides a more accurate effect! Together with microsurgery techniques, which allow him to see the details of your mouth up to 26 times more clearly, this emerging technology provides you with the best sinus lift possible. After your sinus lift or ridge regeneration, you will need time to properly heal before your implants can be placed. Your healing period may take up to 6 to 8 months, but remember, individual results will always vary. If you haven’t already noticed, Dr. Cross has a penchant for deploying the very latest and up-and-coming dental technologies. 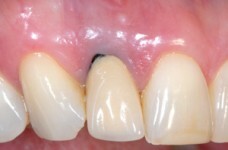 Whenever possible, he uses the Simplified Microsurgical Implant Lifelike Esthetics (SMILE) Technique for his implants patients in Springfield, which is an advanced approach to placing implants in the anterior zone, or front of the mouth. Even if you have damaged or diseased teeth that require extraction, you still may be a candidate for the SMILE Technique. The SMILE Technique is special because Dr. Cross uses microsurgical instruments to preserve as much of your jawbone around the surgical site as possible. 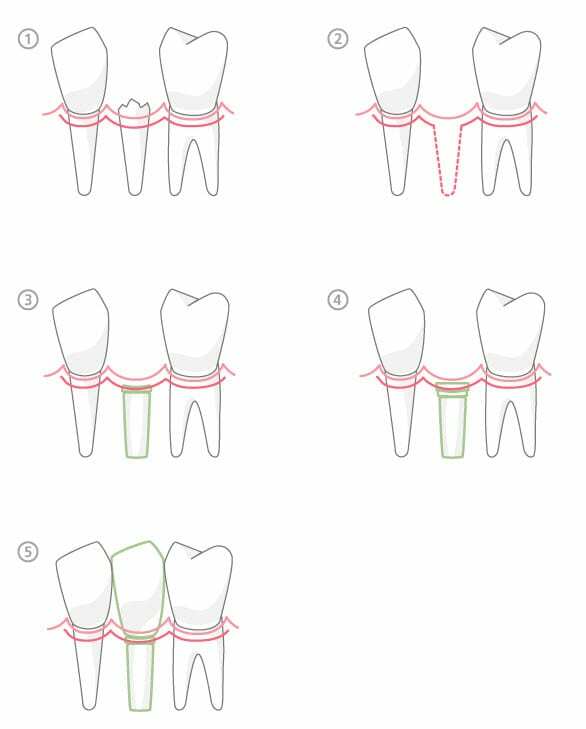 The implant is placed during the same appointment as the tooth extraction, and a temporary crown is custom-fabricated to have the exact shape and contours of your original tooth. To sum it up, you walk in with your natural tooth still in place, and walk out having had it extracted and replaced with a tooth crown – all in the same day – using microsurgery to make the process as effective as possible! As you can see, Dr. Cross is not only very well educated on the implants process; he leads the pack in using the latest tools and techniques to make the oral surgery more beneficial with patients. When it’s time for you to trust your smile to a periodontist, there’s no one better to work with than Dr. Cross. To schedule an initial consultation with Dr. Cross, call his Springfield practice to inquire about dental implants at (217) 793-0196.